I’d like to end my day at my other favorite place which is right here at our master bedroom. Other than a place to get a good night sleep, this room is a place where I can cut myself out from the world. I can relax and unwind from a long day at work or from going out and about on a weekend. Our master bedroom have great structure that I can work with. It had soft new carpet, large windows with abundance of natural light in the morning, and a high ceiling that made the room feel so open and airy. My goal for our master bedroom was to make it feel serene, relaxing, cozy and somewhat gender neutral for Peter and I.
I absolutely love high ceilings. But the downside of having that extra feet on the top of the ceiling is when it comes to painting. Also dusting the ceiling fan can be a challenge. Just thinking about preparation made me feel uneasy. According to my lovely husband I can be clumsy (sometimes). So imagining myself on a scaffolding and trying to put a painter tape on the highest curve of the ceiling is 12 feet – the chances of me injuring myself is scary. So we hired a professional painter for this one. The contractor got this room done within a day. 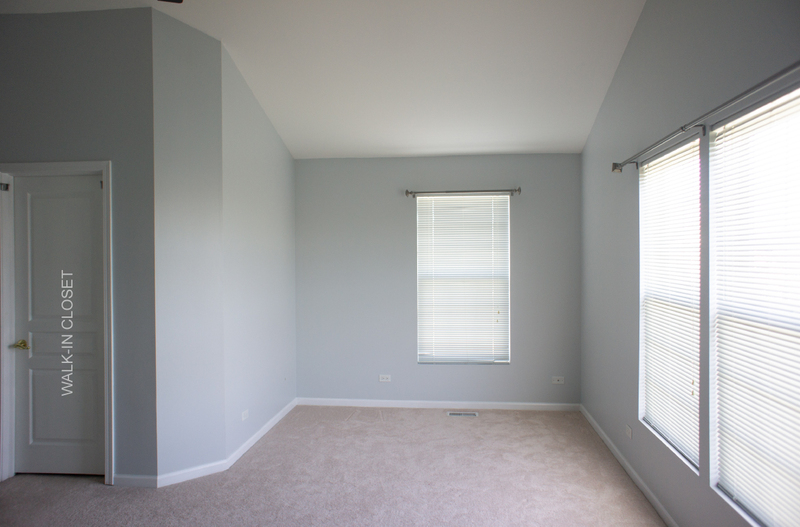 The entire master bedroom was painted with beige color. It was a pretty color but felt outdated to me. It would not worked with the look and feel of what I wanted to create. 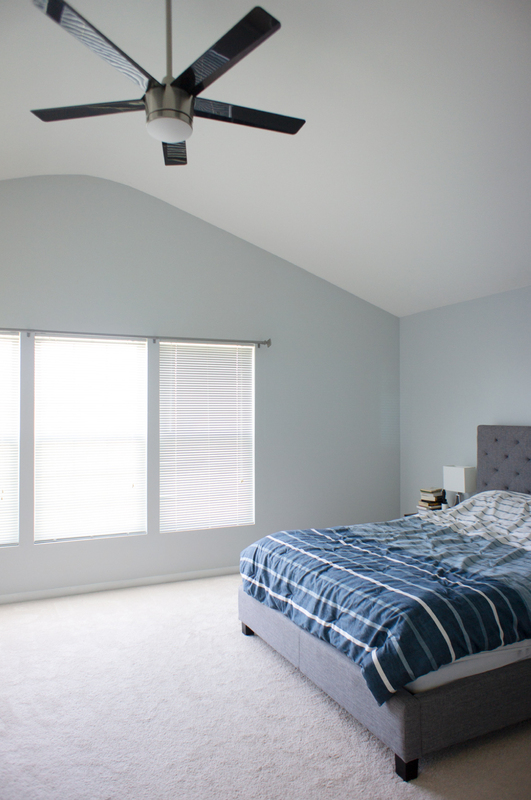 For the entire room, I chose Olympus White from Sherwin-William: light cool gray with blue undertones. 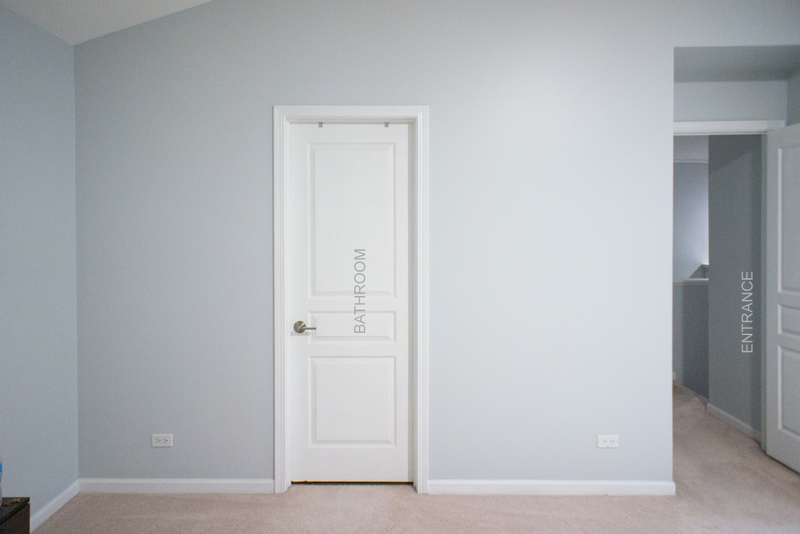 This shade of gray contrasts really well with white baseboard, ceiling, trims, and doors. Painting the room in this color helps elevate the openness and airy feeling that is already there with the high ceiling and natural light. A few more reasons I love this color is that it is very neutral, creates a calm effect, and it’s also versatile for interior decorating. When I moved out from my old apartment, I decided not bring any furnitures with me. Since all of them are so old and I wanted to start off fresh. And of course furniture shopping is so much fun:) The first thing we bought for our bedroom was a queen size mattress from a local store and a bed frame from OverStock. 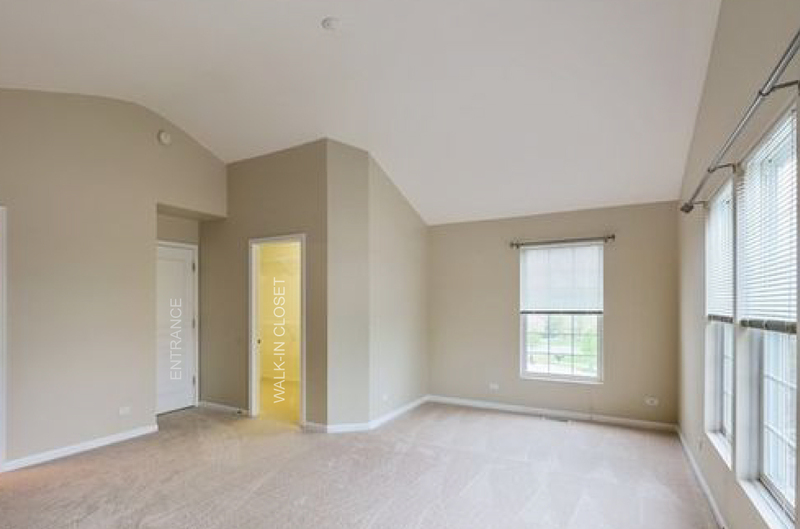 While my focus was on a dining room, living room, home office and our wedding, I did not have a clear picture of what would be the style of furniture I will be using in this room. We were in desperate need for a bed so I picked a bed style that I liked at the time. It’s a grey and simple styled bed that is easy to mix and match with other furnitures. If I know what I know now, I may have picked a different more specific bed style. The bed is good and I can very much work with it still. While we were fixing the other rooms, we added things here and there like a ceiling fan, night stands, etc… We replaced old knobs on drawers and cabinets with gold shiny knobs and satin chrome handles. Since the dining area and living room was done, it was nice to be able to focus on designing our master bedroom.